Shown at the trial of Bill Baroni and Bridget Ann Kelly, the government exhibit shows the traffic lanes on the George Washington Bridge closed off with cones to bottleneck drivers coming from Fort Lee, New Jersey. 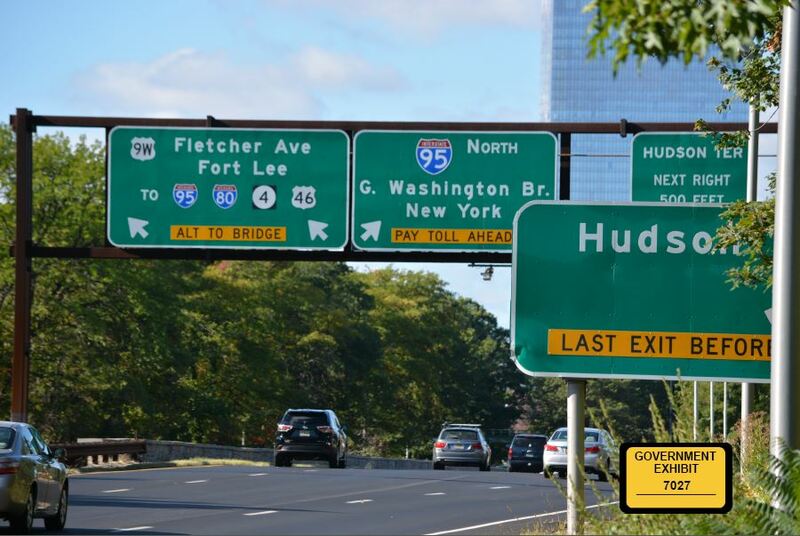 PHILADELPHIA (CN) – Lawyers for two of the convicted Bridgegate defendants argued Tuesday before the Third Circuit that no laws were broken when politically orchestrated lane closures caused bad traffic, even by New Jersey standards, in 2013. William Baroni Jr. and Bridget Anne Kelly received prison sentences last year for using the George Washington Bridge to exact vengeance on a Democratic mayor of Fort Lee who did not want to endorse the re-election of Governor Chris Christie. At oral arguments Tuesday in Philadelphia, lawyers for the duo claimed that such conduct amounts only to “nasty politics,” nothing criminal. Levy also said the shutdown was part of the political process, claiming that it would not have been a crime if Baroni had been upfront about the gridlock being the result of Fort Lee falling out of political favor. “Politics does not need to be separated from public life,” he said. In court filings last month, Levy argued that neither his client nor Kelly had advanced a personal agenda by shutting down the lanes, and that acting on behalf of Christie’s political agenda is not a crime under anti-bribery statutes. “Allocating or reallocating public resources for political purposes — even politically punitive purposes — may produce political consequences, but it is not a federal crime under any of the statutes charged here,” Levy wrote in a March brief. Federal prosecutors introduced this photo at the trial of Bill Baroni (left) being embraced by New Jersey Gov. Chris Christie. In similar briefs, Kelly’s attorney Jacob Roth of Jones Day argued that the motive for reallocating the bridge lanes is immaterial. If motive was a factor, Roth argued, the trial judge erred in not instructing the jury regarding motive. Roth also focused his arguments Tuesday on the supposed right to intrastate travel — one of the civil rights charges upon which Baroni and Kelly were convicted. “Criminal prosecution is not the right forum for the creative extension of constitutional rights,” Roth said. After a federal jury in Newark convicted Baroni and Kelly in 2016, Kelly received 18 months in prison and Baroni was sentenced to two years in jail. Kelly had been one of Christie’s senior staffers, while Baroni was Christie’s top appointee to the Port Authority of New York and New Jersey, the bistate agency that controls the busy span connecting the Garden State to Upper Manhattan. Bridgegate, as the scandal became known, made headlines in 2014 after emails and texts between Kelly, Baroni and co-conspirator David Wildstein were made public. “Time for some traffic problems in Fort Lee,” Kelly had said in one particularly incriminating email to Wildstein, another Christie appointee to the Port Authority. Federal prosecutors introduced this photo at the trial of Bill Baroni and Bridget Ann Kelly over their coordination of lane closures on the George Washington Bridge for political retribution. 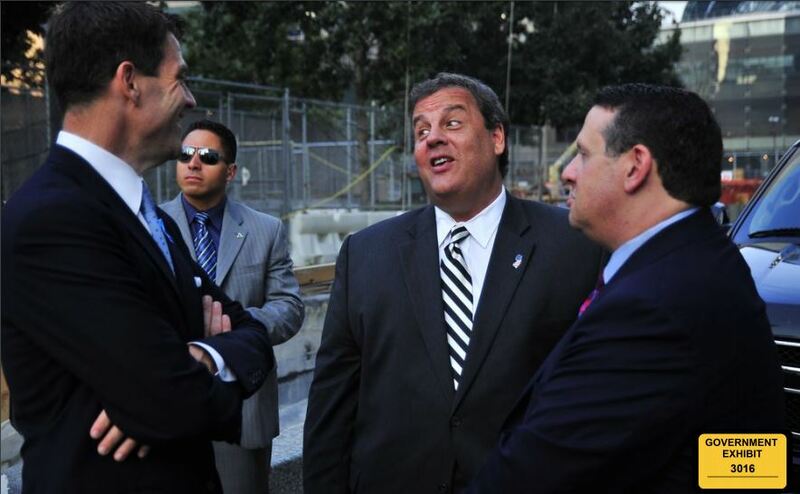 Other communications showed animus between Christie’s staff and Fort Lee Mayor Mark Sokolich. 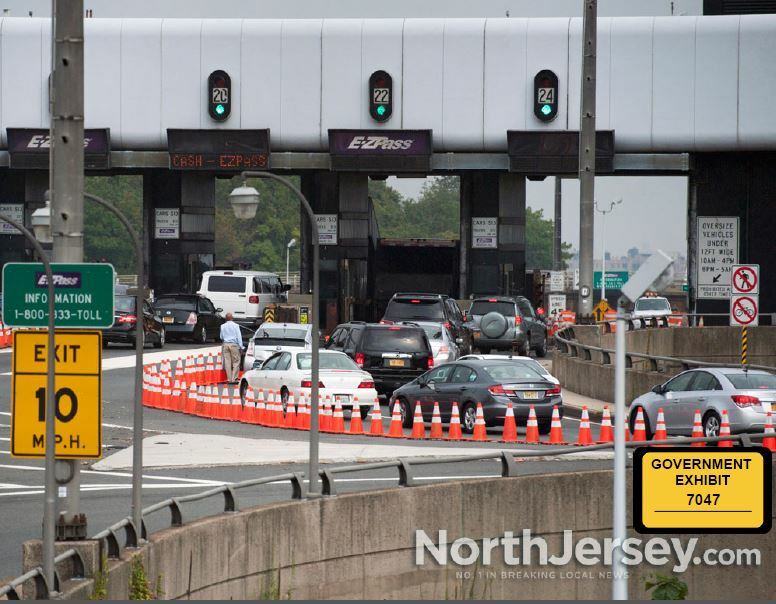 During the nearly two-month trial, Kelly and Baroni argued the lane shutdown was part of a legitimate traffic study, though Kelly also shifted blame onto Christie, saying the governor blessed the shutdown. Lawyers for Kelly and Baroni had cried foul about jury instructions during deliberations, challenging U.S. Judge Susan Wigenton’s ruling that prosecutors did not have to prove that Kelly and Baroni were motivated by a desire for political payback. Kelly and Baroni appealed their convictions almost a year ago exactly. During today’s hearing, much of the discussion centered around the 1980s Third Circuit case Lutz v. City of York, in which local officials in a Pennsylvania town banned “repetitive driving,” or cruising, during certain hours. 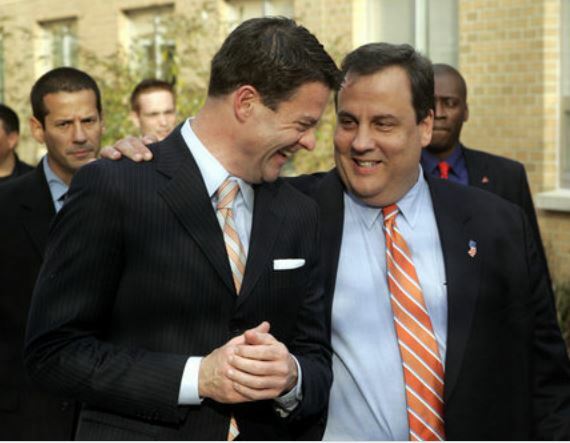 Federal prosecutors introduced this photo of (left to right) Bill Baroni, New Jersey Gov. Chris Christie and David Wildstein at Baroni’s trial. For Roth, the Lutz case involved a specific government ordinance banning travel. He called it a “substantial leap” to link the Lutz case with Bridgegate. Lutz appeared to hold significant weight, however, with U.S. Circuit Judge Thomas Ambro. “In this circuit, in a very long opinion with a lot of analysis … ultimately our court concluded 28 years ago that there is a fundamental right to intrastate travel,” Ambro said. Counsel for Baroni and Kelly also argued their clients had not gained anything from the lane shutdown, and that there needs to be some private benefit to prove misuse of government resources. Roth noted that even the use of additional toll collectors while the lanes were shut down were still serving public use. “That toll keeper was not doing Baroni’s laundry,” he said. Ambro focused meanwhile on the illegitimate way the collectors were used. “But the Port Authority exists to prevent traffic jams,” he said. Ambro also at one point described the four-day lane shutdown as “overkill on overkill,” noting that Fort Lee would have gotten the point after one day of massive gridlock. The Justice Department attorney, Bruce Keller, argued that Baroni’s actions in shutting down the lanes were unauthorized, and that the fact that the faux traffic study was never looked at shows there was no legitimate use. “We’re not at the outer limits here,” Keller said.